The Harrier is a British design. It is famous for its ability to take off straight up by rotating its four engine exhaust nozzles downward. When carrying a full load it needs a short takeoff run. The Harrier has a very big and powerful Rolls-Royce jet engine. The enormous air intakes on the front are required to provide all the air it needs at full power. 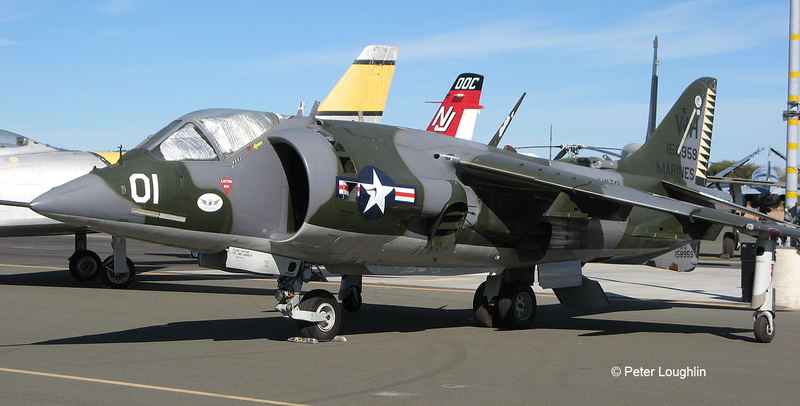 The Museum's Harrier at the Wings Over Wine Country Air Show. The Harrier is a subsonic attack jet, designed to take out ground targets. Even so, they have air-to-air combat capabilities. Our Harrier 158959 first flew on May 25, 1973 and was delivered on July 5, 1973 to VMA-542 “the Tigers” under the command of Col. Stan Lewis. In 1983 she was modified from an A model to a C model. 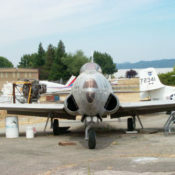 She was retired in 1985 and in 2005 was brought to the Pacific Coast Air Museum for restoration. 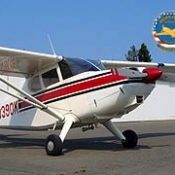 In 1957 Chief Designer Sir Sydney Camm and Senior Project Designer Ralph Hooper at Hawker Aircraft Limited in Kingston England began work on a STOL aircraft project number P 1127 built around Bristol’s new Orpheus engine. 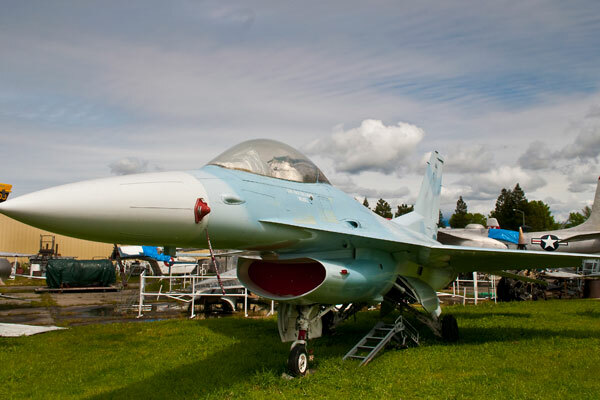 With funding from the United States Mutual Weapons Development Team (MWDT) the P 1127 was created and on November 19, 1960 made its first flight. It was decided to create a test and evaluation squadron for the P 1127 and on January 16, 1963 the Tripartite Agreement between Britain, the United States and Germany was signed in Paris and the aircraft was given the name Kestrel. Although maintaining its basic fuselage the Kestrel underwent a 90 percent redesign and early in 1967 the British Government named it the Harrier GR Mark 1. On December 28, 1967 the first production Harrier took flight with the 19,000 lbs. thrust Pegasus 6 engine and on April 18, 1969 Royal Air Force Fighter Squadron No. 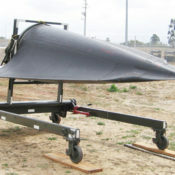 1 received its first Harrier. In May 1969 two Royal Air Force No. 1 Squadron Harriers won the Transatlantic Air Race from New York to London in the “subsonic aircraft class” with a tower to tower time of 6 hours 11 minutes and 57 seconds. 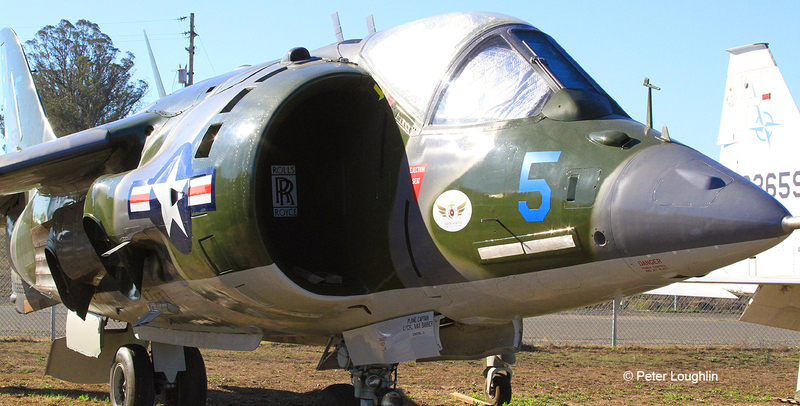 In 1970 Congress authorized the purchase of 114 Harriers for the U.S. Marine Corps. In March 1971 Marine Attack Squadron 513 (VMA-513) received its first Harriers followed by VMA-231 and VMA-542. 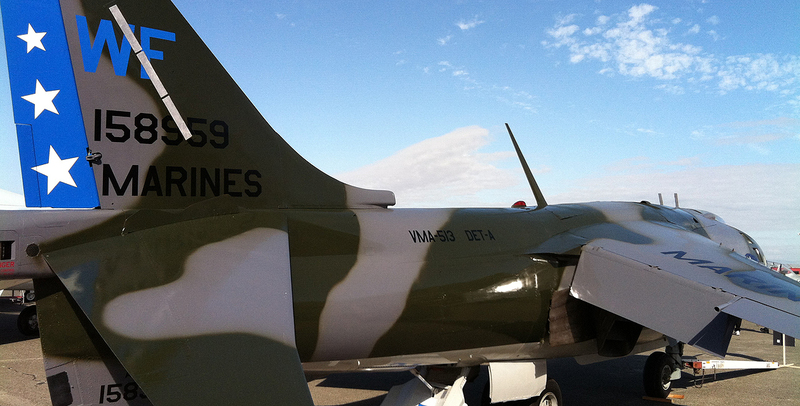 In 1976 the two seat TAV-8A trainer entered service with VMAT-203. A total of 102 AV-8A and 8 TAV-8A Harriers were built. Our Harrier was the forty second built. Our Harrier 158959 first flew on May 25, 1973 and was delivered on July 5, 1973 to VMA-542 “the Tigers” under the command of Col. Stan Lewis. 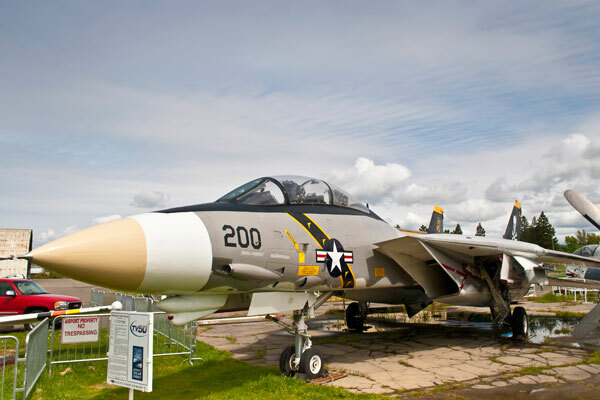 In 1983 she was modified from an A model to a C model incorporating some of the developments from the new AV-8B Harrier II program. 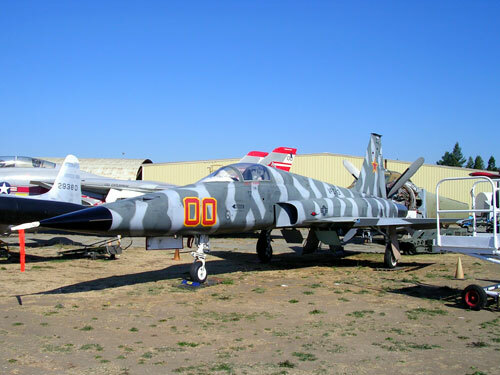 She was retired in 1985 to AMARC at Tucson Arizona and in 2005 brought to the Pacific Coast Air Museum for restoration. The Harrier is designed to operate from remote and harsh environments, including ships at sea with only minimal maintenance and servicing needs. Harriers are capable of high sortie rates of over 10 per day and one Harrier achieved a high of 41 sorties on one day in 1974. With the ability to Vector In Forward Flight (VIFF) the Harrier is a very capable fighter. During the 1982 Falklands war British Harriers shot down 20 Argentine fighter and attack aircraft with no losses of their own. Second generation Harriers operate all over the world today as the AV-8B+ (United States), GR-9 (England), EAV-8B+ (Spain), AV-8B+ (Italy), FRS-51 (India) and will continue to be a powerful asset to military commanders around the globe for many years to come. Disposable: AIM 9 D/G Sidewinder air-to-air missiles, Mk. 81, 82, and 83 free fall or retarded bombs, cluster bombs, and LAU 69A 2.75 inch rockets.